End manual marking of documents and PDF files ― Have full document identification ability that is intuitive, automatic and easy to use. Prevent a "copy" from ever becoming an original by embedding "non contrast-sensitive identification" into the text of the paper or PDF document. No hunting for headers for footers. 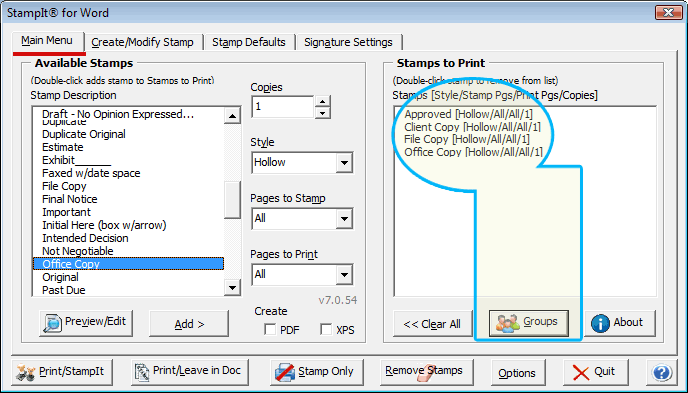 Create ANY STAMP you need ― in hollow, shaded (watermark) and solid format ― and use it immediately for your document marking. 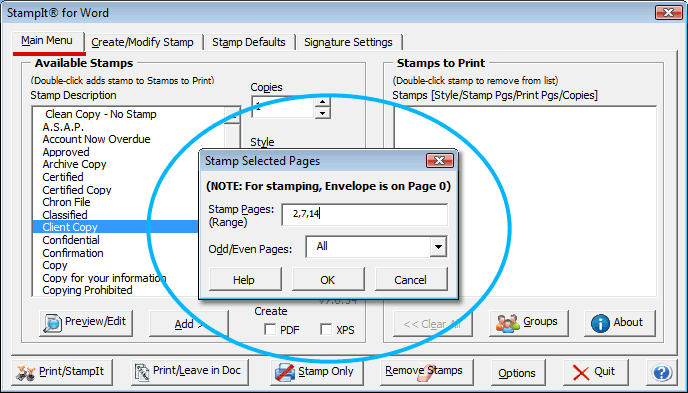 Create multi-line Bates and image stamps too. Provides complete versatility with customizable presets for 8 different stamping postions as well as full control size, shape and style. Forget rubber stamps. Print multiple copies of the same document ― with a different electronic "rubber stamp" on each copy ― all in one print session ― saving an average of $750 per year. And, yes, StampIt supports COLOR. 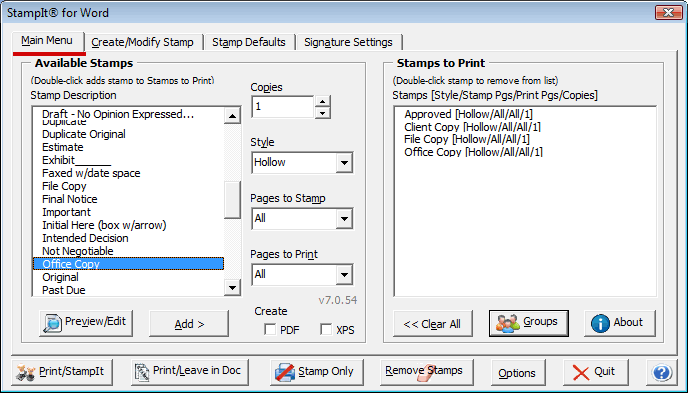 Print entire documents (PDF included) while only stamping selected pages, e.g. 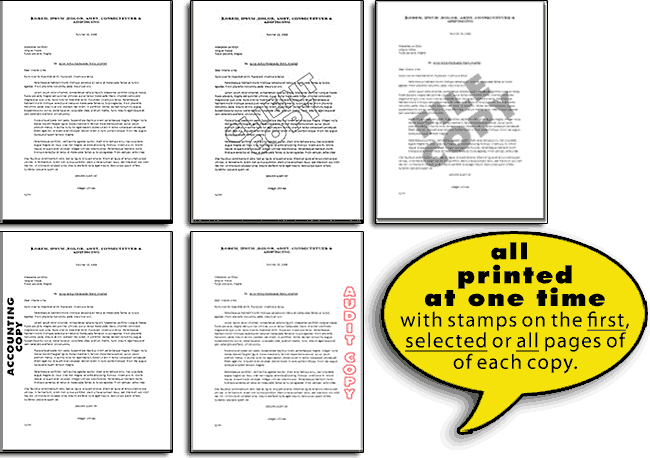 stamp pages 2, 7 and 14 "confidential" when printing all pages of a document. Provide a compliant, proactive approach towards document management and security. Eliminate confusion about the intent of your document. Saves user-defined groups of stamps, e.g. 1 clean copy, 2 "file copies" and 1 "client copy" all to the user's own description to ensure a consistent marking policy. Graphically "sign" your documents (usually the copies, etc) with a graphic or custom text associated with a particular stamp. StampIt standardizes document marking the way YOU want it. It installs with 58 common words and phrases and allows instant custom stamps ― in any hollow, watermark or solid format as well as graphic images and Bates.